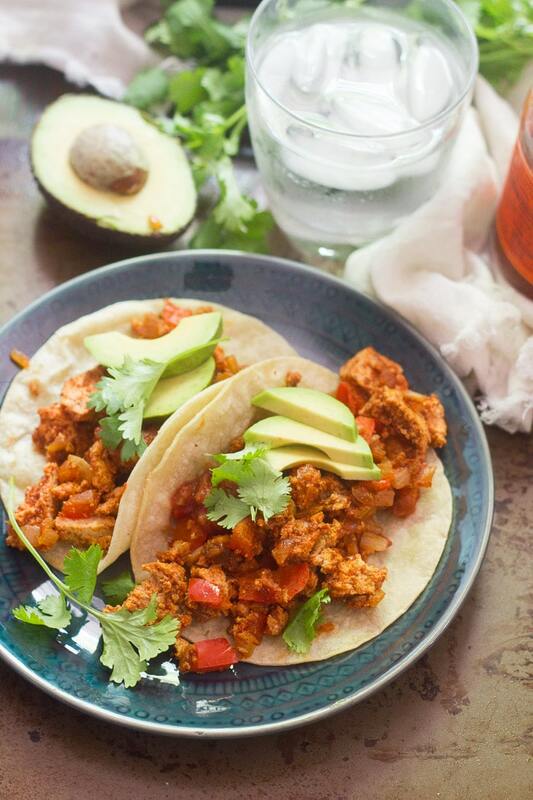 Tofu makes the best vegan taco meat! The trick: freeze your tofu for the perfect crumbly texture. 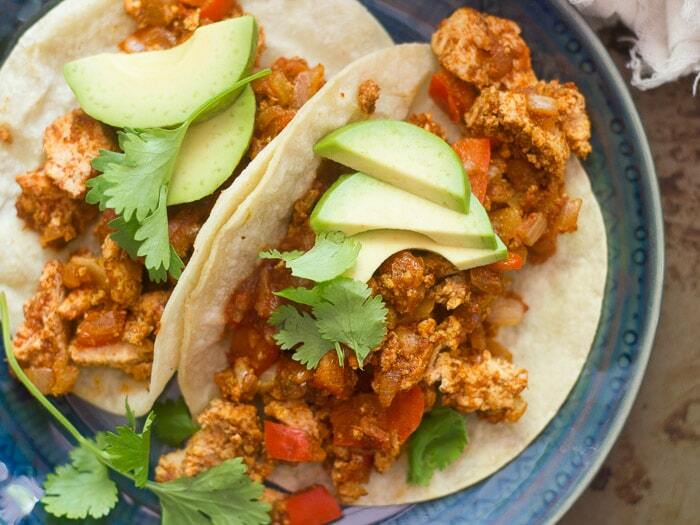 Then sizzle it up in a skillet with Tex-Mex spices and stuff it into warm tortillas to make these amazing tofu tacos! I initially named this post “frozen tofu tacos.” But the tacos themselves aren’t frozen. Frozen tacos not involving chocolate don’t appeal all that much to me. And no, the tofu is no longer frozen when you make it into a taco, but “thawed tofu tacos” sounded like a weird title. And finally, the freezing step in this recipe has nothing to do with convenience or long term storage, though that might be an incidental benefit. The texture of tofu changes when you freeze it. If you fall into the group of people that avoid tofu for not being fond of the texture, this just might be the tofu recipe for you! 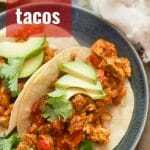 Tofu tacos made frequent appearances on my dinner menu when I was in college. Back then I didn’t know about freezing tofu. My recipe was also much simpler: some crumbled tofu cooked in oil and taco mix. If you’re in a pinch, that version is actually pretty good. It came to mind when I was thinking back on old recipes from my past that I might want to share for this blog. I decided it was time for a more grown-up version of the recipe. The extra effort involved in the little bit of chopping and mixing up your own seasonings is well worth it. I also realized that frozen tofu would be perfect for this recipe. So what does happen to tofu when you freeze it? It takes on an extra firm, extra texturized crumbliness. That’s about the best I can describe it. Any excess water that is left in the tofu when you freeze it will squirt right out when you crumble it. Seriously, be careful. I squirted myself in the face when I was making these. When you cook up your frozen tofu you’ll get a texture that isn’t too far from some of the meatless crumbles you can buy at the store, but it’s a bit lighter. So, how do you go about freezing tofu? Well, thanks for asking. I’ve got my very own little step-by-step-process on how to freeze tofu. It’s easy! Grab some tofu. This can be a brand new, unopened package of tofu, or a piece of uncooked tofu that’s leftover from a recipe. Doesn’t matter! It can be pressed, or it doesn’t have to be. If it’s not in a package, stick it in a freezer bag. Pro tip: if it is unwrapped, cut it into single serving-sized pieces, so you can thaw just as much as you need, when you need it. Stick it in the freezer. Leave it there until it’s frozen solid. When you’re ready to use the tofu, pop it out of the freezer and thaw it. You can speed up this process in the microwave or by placing the tofu, still in its package or a sealed bag, into a bath of hot water. That’s it. Take out as much as you want to use just a few hours before serving and you’ve got a whole new tofu. I know it seems really simple, but when I started doing this I had a bunch of questions. How long would I needed to freeze my tofu in order to change the texture. It doesn’t seem to matter. Should I press it? Again, doesn’t matter! What kind of tofu does this work best with? Extra firm, but I’m sure regular old firm tofu would do the job too. Tofu that’s been frozen tends to burn more easily than tofu that hasn’t, so watch it extra closely during cooking. Extra firm tofu works best for these. I really like Trader Joe’s and Soyboy Brands, as they tend to be the firmest. 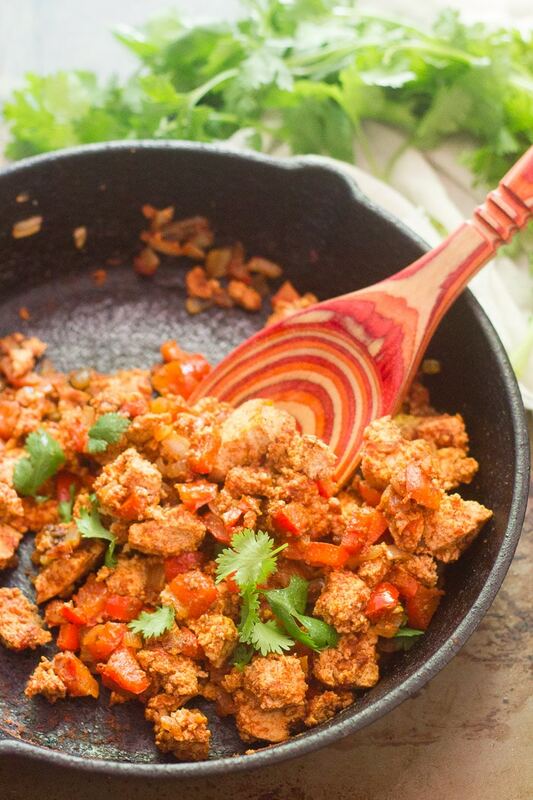 Switch things up by putting the tofu taco filling into burritos or bowls instead of tacos. Heat the oil in large skillet over medium-high heat. Add onion and sauté until soft, about 5 minutes. Crumble the tofu into the skillet, keeping it as chunky as you like. Cook about 2 minutes, or until it begins to brown. Be careful, as tofu that's been frozen tends to burn quicker. Add the bell pepper to the skillet and cook about 2 minutes more, until it begins to get tender. Add the tomato sauce, soy sauce, hot sauce and spices to the skillet, and continue to cook just until everything is well mixed and the liquid dries up just a bit, about 2 minutes, adding a bit of water to the skillet if it dries too much. Divide the mixture into taco shells and top with toppings of choice. Perfect! I actually try to keep a stash in the freezer at all times. Enjoy!!! Tofu out of the freezer, in large chunks, always has an odd texture. But crumbling it up seems to be a great way to use frozen tofu. I’ll have to try it! I always stock up on a local made tofu when I happen to be at the grocery store that sells it, but I sometimes have a hard time eating it all before it goes off. I will use this for sure! Yeah, I always crumble my tofu after freezing. I bet you’ll like it a lot better this way. Fresh tofu is amazing but doesn’t last that long, so if you like it crumbled that would work out perfect. Hope you enjoy!!! Just made this today, and it’s literally better than normal mince!! So delicious! I LOVE the tip for freezing tofu! I know exactly the texture you are talking about but never knew that you could make it happen like that. 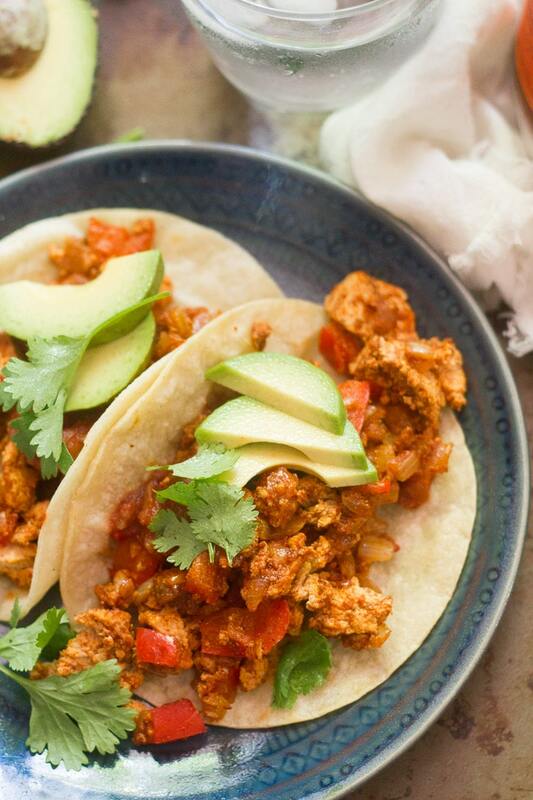 These tacos look incredible! I’ll have to try your tofu freezing method. I’ve never done that before. Great blog post, thanks for all the tips! Thanks Nicole! Definitely give it a try! Very welcome! :) I’m glad you’re enjoying the recipes. Thank you so much for following! Alissa, another big hit!! I added more tomato sauce then mentioned and use no oil, so water sautéed the veg and tofu. What a delicious dish! I must be your biggest fan! Thanks and keep them coming! Yay! I’m glad these were a hit!! Thanks Cathy!! I made it last night and it was delicious! 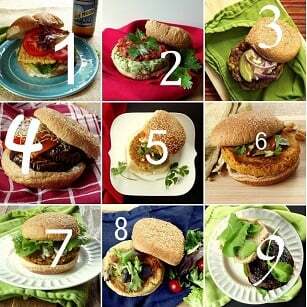 My husband is not vegan and he just loved it! Thanks very much for sharing! Yay!! I’m so happy to hear that! Thanks Annie! We make these at least once a week. Excellent recipe! So amazing! I don’t usually like the texture of frozen tofu, hence the reason why I have some in the freezer that I literally abandoned. Just popped it out now! I’m so giving this recipe a trial. Love this! Yay! I hope you enjoy it!! First time making this dish. YUM! Great taco filling, good for pasta and enchiladas. This was very good and made great tacos and nachos. The directions didn’t say, but I squeezed all the water I could before crumbling the tofu and adding it into the pan. I also increased the tomato sauce to 1/2 cup. Overall, this is a keeper recipe. I’m glad you liked it! Thanks so much!